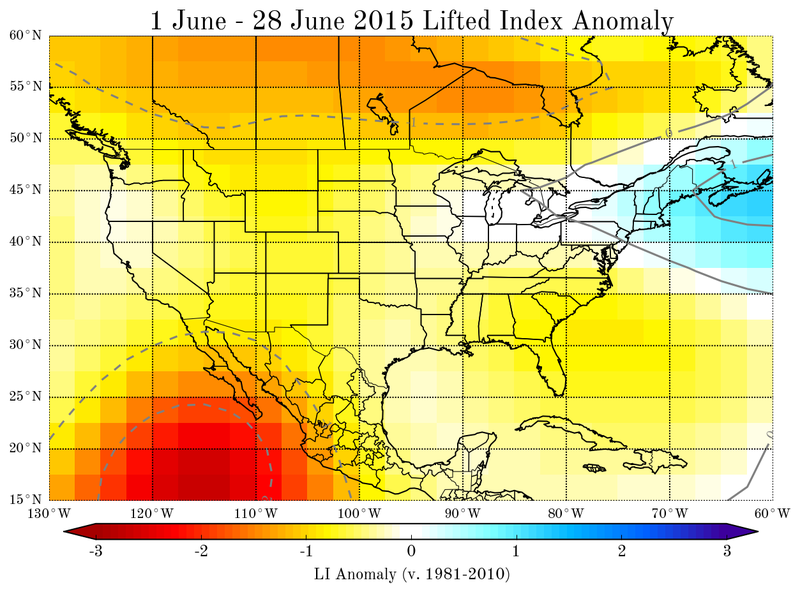 In early March 2015, I attended a D.C. workshop focusing on subseasonal forecasting of severe convective storms. For me, a main takeaway from that meeting is that we (as a community) are ready to push the envelope of severe storms forecasting beyond the current one-week limitation in operational products (Storm Prediction Center outlooks are capped at Day 8). Such forecasts are likely already being made in the private sector, i.e., insurance companies, and it's likely that new tools and techniques (many presented at that D.C. meeting) would provide skill over climatology, even at monthly lead times. Not wanting to waste an entire year of forecasting before meeting with this group again (and with peak convective season rapidly approaching), I started ERTAF with the hopes of both success and failure in order to gain knowledge and experience for a better operational product in the future. Tabulations of verification for these forecasts (first official monthly forecast was for April 2015) are available to the public, and I have blogged about them here and here. March, April, and May forecasts were very successful given the inaugural nature of this project, and I am excited to see where this project will go in the future. Today, 1 July 2015, marks the end of ERTAF 2015. Final updated statistics are available on the homepage, but I thought I would make one last BLOG entry with the verification results for the June monthly forecast. The preliminary tornado report count for June 2015 is going to end up somewhere near 170, with a 30-yr normal of 219, putting June 2015 at ~78% of normal, or what we consider to be "average" here. My personal forecast was for 235 tornado reports in June, so this turned out to be a tad lower than expected, but still verified nicely with the forecast percentages. A straight forecast of climatology would have produced a score of 10/31 on the ERTAF scale. 2015 forecasts doubled that of climatology, with a score of 20/31. Tornado activity monthly forecasts for April, May, and June all verified within their respective activity zones (no formal forecast was issued for March). Environmental verification from reanalysis is the way to go in the future. Need better real-time reanalysis data sets with variables pertinent to severe convection. Good forecasts, bad timing problem (see May 2015). Day of week cutoff hampered some good forecast signal. Perhaps identification of 'active', 'inactive', and 'average' periods (with buffer) is worth discussing. Areal outlooks (esp. for monthly forecasts) seem possible. May resemble climatology a lot of the time, but could be useful when there is strong signal both in statistical analogs, CFSv2, MJO, GWO, ENSO, etc. Need to get more feedback! Why did it have to end at this part of the season? It didn't *have* to, but most of the research surrounding this sort of work has only tackled the "heart" of U.S. tornado season (MAMJ). Next year, we will likely consider doing the entire year, but that does take more work and planning. Thank-you for your comment!